Today I found out why people’s voices sometimes crack during puberty. The mechanics of a person’s voice is an awesome biological phenomenon. It all starts with the air in the lungs. As air passes from your lungs to the outside of your mouth, it can be manipulated in several ways. Should you decide a vow of silence is appropriate and simply want to attract the ladies with your dance moves, you can force air out and all that is heard by others is the sound of wind rushing from your mouth. Should you need to take a more Opera Winfrey approach, you can channel the air such that you use your larynx, or voice box. Once you activate your vocal system, the air in your lungs gets pushed up by the relaxation of your diaphragm. It then goes through your trachea and out a small orifice that has two folds of skin (vocal cords) on either side of it, in the shape of a V; this is called your larynx, or voice box. As the muscles that attach to your voice box tense and relax, they create a vibration of the cords. As these cords vibrate, they release pulses of air. The tension in these muscles creates the differences in frequency, the higher the tension, the higher the frequency and, therefore, the higher the pitch. This frequency is measured in hertz (how many times a second this repeats). For example, typical vibrations from speech usually range from approx. 200 hertz-8,000 hertz. 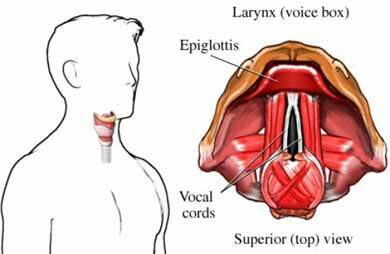 When we are kids, our larynx is relatively small and our vocal cords are relatively thin. Think of guitar strings, the smaller and thinner the string, the higher the pitch. As boys go through puberty, the increasing amounts of testosterone leads to a lengthening of the cartilage of the larynx and a thickening of the vocal folds. This lengthening and thickening deepens the tone in their voices, similar to the effect of lengthening and thickening a guitar string. Along with the “guitar strings” of the voice box getting bigger, there are also other features affecting the sound of one’s voice that are changing. For instance, things like the nose, back of the throat (hypopharnyx), sinuses and facial bones getting bigger will affect the ultimate sound of the voice. These bigger features create more space in your facial area, giving your vocal sounds more room to resonate. The changes to the voice box generally take place gradually over a period of time. Sometimes, however, when there is a dramatic period of change, the body has not “grown into” its newly sized cords and vocal mechanism and has trouble adjusting, in terms of being able to make steady sounds. So the sudden and differing growth rates of everything involved in making sounds causes the brain to sometimes have a hard time controlling the voice mechanism to maintain a steady vibrating resonance. As a result of this, poor little Billy must endure his voice cracking from time to time while his brain adjusts to the quick changes his body is going through. Puberty usually begins between the ages of 9 and 16. When we are born, boys’ and girls’ vocal folds are similar lengths. They measure about 2 millimeters long. Girls’ vocal folds grow 0.4 mm in length each year, but boys’ vocal folds grow 0.7 mm in length for the same time period. This growth eventually slows down, leaving girls with a maximum vocal fold length of around 10 mm and leaving boys with a length of around 16 mm. Paragraph 4: “effect” is used incorrectly. The word you were looking for is “affect”. “Paragraph 4: “effect” is used incorrectly. The word you were looking for is “affect”. CLAPCLAPCLAP YAY! You win the prize! You are the king of the hill! you found something to argue about! @phelsom: Yep 🙂 Essentially, when your diaphragm flexes, you breathe in, when it relaxes you breathe out due to the relaxation of your diaphragm combined with the elasticity of the lung. This is backwards from what many people think. Actually my friend you are wrong. When your diaphragm contracts, it is pulled down.